I spent a week with one of Dodge’s revived nameplates. The mighty Challenger and the Charger evoke many memories and tales of forbidden stunts for a lot of drivers, and I remember hearing about many storied adventures. I also remember getting a ride in 340 6-pack and 440 6-pack Mopars that my brother owned, and marveling at the sheer bravado on wheels. Though the less-than-Hemi versions of today seem a bit tame, they are completely modernized and make up for the lack of hairy-chestedness with a sack full of refinement and, to date, unparalleled build quality from Dodge. I spend a week with the new Charger, and though I was hoping for a Hemi SRT-8, it arrived in V-6 all-wheel drive format. Chargers start at a lofty CDN $29,995 and this one, as tested, was CDN $40,570. I thought the previous generation of reborn Charger came across as a bit bland. It felt as though something was missing, and leaned a bit toward rental car. Looks are personal, of course, but that’s what I thought. I love the new one. It’s taken a decent shape and made it what it should have been. The styling is bolder, including the love-it or hate-it stamped scallop on the side, which is a big nod to the car’s historical forebear. The front end has been given a serious dose of aggression, and the hood has lovely extended divots in it. There’s a strong beltline that makes its way into a handsome shoulder that extends into the trunk lid deck. The rear end is treated to rectangular tailpipe finishers, which should have been put on all the previous-gen cars too, and the tail is completed with awesome, infinite-loop race-track rear lights. What you don’t notice as much when one drives by is how big this car is. This car is really, really big. It’s long. It’s wide. It’s tall. It’s BIG. Under that nifty hood sits Chrysler’s new Pentastar V-6, a modern 3.6-Litre putting out 292 HP at 6350 RPM and a solid 260 lb.ft of torque at 4800 RPM. The Pentastar has been mated to their new 8-speed automatic – it’s a major improvement from whence their transmission offerings came, but has a little way to go until it’s perfect. Fuel economy is respectable, considering the heft, size and performance you’re driving around with. This package is rated at 11.4 L/100 km (20.6 mpg) in the city and 7.3 L/100 km (32 mpg) on the highway. I saw 12 L/100 km (19.6 mpg) during almost exclusively city driving, with little to no effort to save fuel. That’s very, very good. Oh, and guess where this car (when it’s not all-wheel drive) sends the go-forward stuff? The rear wheels! It’s practically alone in this class, and I’m grateful to Chrysler for trusting us with a large rear-wheel drive (based) sedan. Like the outside, this car is big on the inside. There’s lots of space with excellent headroom. The dash is made up of big shapes and mostly pleasing styling, and the interior is put together out of nice materials – soft touch plastics, great textures, up-scale leather. In this case, the leather was red, which took me back to the 80’s and not in a good way. I’d stick to a less flamboyant color. The heated and power adjustable seats, though highly comfortable, are clearly made for people much larger than me. The bolstering is lackluster and I was sliding all over the place. Not only that, but these are the “performance” seats – I can’t imagine what the cushy ones are like. The power-adjustable steering wheel has controls for cruise, handsfree, phone media and the driver information screen. Behind it sit two large gauges – the driver info screen sits between them. The gauges sport a simply horrible font choice, and the speedometer is actually difficult to read quickly because of that. The center stack starts with the media system on top. It’s composed of a small touch-screen surrounded by hard buttons. Although I longed for a larger screen, it was easy to read, well laid-out and highly responsive. It’s mated to an Alpine-branded stereo that offers AM, FM, satellite, USB, auxiliary and CD sources, and sounds alright. I liked that the tech isn’t overly complicated and layered here. The voice recognition is very fast and accurate and as I said, it’s not layered. Say “Dial Home” and it dials. No need to confirm, no this, no that. I love that! Below that sits a dual-zone automatic climate control system. The center console is very wide, and houses the shift lever and a huge armrest. I liked the armrest, but if you don’t like to permanently have one RIGHT THERE, it might be a bit much for you. The shift lever took me almost all week to get used to. It pivots fore and aft from a central position, and takes a minute to figure out. The basics are here – power windows, door locks, mirrors, trunk release. Some goodies too – push-start ignition, power adjustable pedals, automatic HID headlights, HomeLink garage door openers. Oh, and adaptive cruise control, which works very well if you want to sleep on the highway. Other safety stuff includes a blind-spot monitoring system and a cross-path collision detection system, which makes loud sounds and flashes things if you’re going to crash into stuff. Storage is plentiful. There are a number of lovely cubbyholes and bins, 2 cupholders (which can be independently heated or cooled, y’all!) with a sliding cover, a bin under the armrest, a decent glovebox and usable door bins. The trunk is large too – 16 cubic feet (453 Litres) of it are sitting there, waiting patiently to swallow a side of beef or whatever you might need to transport. And the rear seats split 60/40 to increase space, if rigor mortis has set in. The bigness doesn’t end here. You’ll find 3 seats, 3 seat belts and 3 headrests. Unfortunately, the rear drive shaft requires a huge tunnel and the middle seat is raised, making this a great rear seat for 2 adults or 3 kids. Legroom in the two outboard positions (which are heated, by the way) is fantastic, and headroom is OK. You get 2 seatback map pockets, door bins, a 12V plug and air vents, not to mention the middle seatback that folds down to become an armrest containing cupholders and a lidded bin. Last, but certainly not least, especially if you’re Catholic or Mormon, you get THREE sets of LATCH anchors, which is very rare. Well, let’s continue with our theme, shall we? The Charger is a big car, and it certainly feels like it on the road. But in my opinion, that’s not a bad thing. This car isn’t trying to be something it’s not. It’s quite honest about being a big, American sedan. Its ride is firmer than you might expect, but still comfortable and it’s perfect for the highway. The handling is well-controlled, and grippy in cornering. The car’s weight shows up mid-corner and you can feel this big beast shifting its mass, and there’s a fair amount of body roll, but it does well for a huge car. 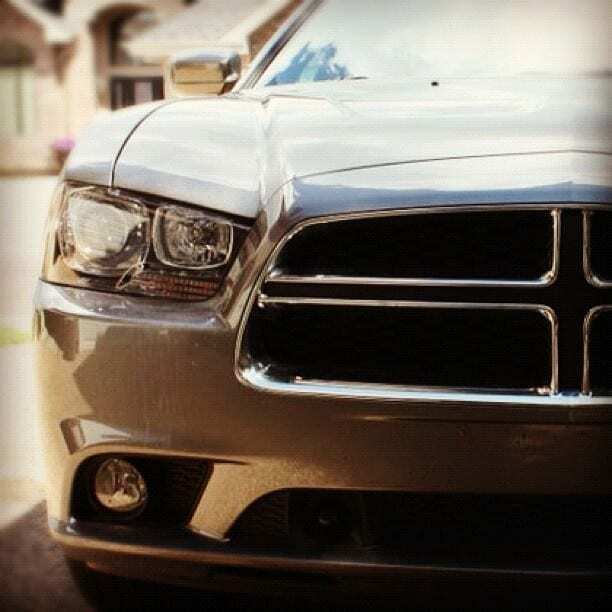 Truth be told, the Charger is simply more agile than its immensity would lead you to believe. Road and engine noise are very quiet, and wind noise didn’t show up until I hit 120 km/h. At those highway speeds, the car cruises very comfortably and effortlessly. The all-wheel drive, while binding at low speeds around corners on occasion, was mostly unobtrusive and I’m sure it would be great in the winter. Here’s where I was most surprised – the Pentastar engine. I was expecting a mid-sized V-6 to be overwhelmed by this behemoth, but it felt surprisingly powerful off the line. There’s no lag from the get-go, and the car is extremely responsive in city driving. Mid-range power is good, and things are quite smooth. I didn’t feel that the power band is totally linear, but overall, it’s a great engine. Kudos to Chrysler for it, and I’d be happy to have a car with one in it. As is the case with most V-6s, it sounds ridiculous, but that’s not a knock against this one – it’s a V-6 problem. Visibility out of the car is good, and the brakes, while having to work hard to bring this big lump of metal down a notch, are decent. The more I thought about it, the more I felt that the Charger is almost in a class of its own. What competes with this thing? There isn’t another rear-wheel drive sedan this big in this price range, with the exception of the Hyundai Genesis. I guess if front-wheel drive isn’t a deal breaker, you might consider the Ford Taurus, Hyundai Azera or the Toyota Avalon. To be honest, I think the Charger competes more with Chrysler’s 300 than anything else. It’s a big car, and it feels heavy on the road. But that’s not a terrible thing. It’s a feeling of being substantial, and it’s an honest car. It felt very well built, and fit and finish appeared to be exemplary. Power isn’t lacking, even with the “base” engine, and refinement is up there. With all that said, the price doesn’t seem to be too high either. The Charger is a car that will appeal to a certain segment of buyers, and I’m absolutely certain those who chose it won’t be disappointed with it. Of course, I’d love the rumble of a Hemi or the venomous SRT-8, but you’re not going to see anywhere near 20 mpg during normal driving with those, will you? I’m surprised to be writing this, but the Charger is a sensible choice. WAF (Wife Acceptance Factor) had its highs and lows. She loved the red seats because they’re “cute”. (Wildsau shakes his head) She liked the ride, and the luxurious appointments, but she felt it was pretty big and ungainly at times. She wasn’t in or out on the styling. I give the Charger a 7.5 out of 10. I’ve often said in my reviews that I’d give another half to full point for an upgraded engine, but the Hemis and SRTs are noted for being thirsty, and for everyday driving, I think I’d be just as happy with this engine and the vastly improved fuel economy. Disclosure: Vehicle was provided by Chrysler.